First Grade Kate: Honored to be on EDUCENTS!! Grab this FREE unit!! Honored to be on EDUCENTS!! Grab this FREE unit!! So excited to let you know that my "Dino-RAUR Math Centers" are FREE on Educents until Friday!! If you haven't heard of Educents, it is a fabulous website that offers great educational products at a discounted price. There are items for teachers, homeschoolers, daycare providers...really anyone who works with kids. 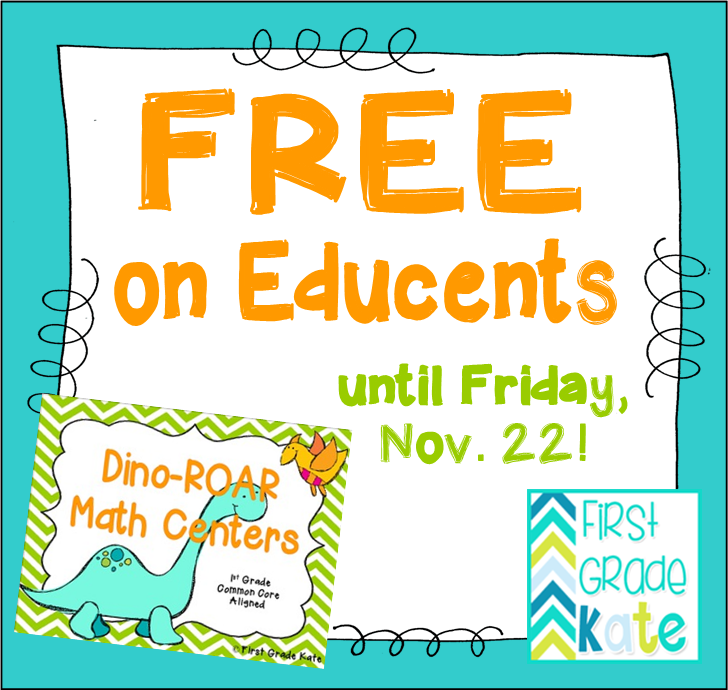 I am honored that Educents chose my dinosaur math centers to be featured as a freebie. It is one of my favorite products in my TPT store! Included are 9 fun, colorful math centers that cover the 1st grade math Common Core standards. Since it is not seasonally themed, you could use it in your room at any time of the year! Head on over to grab these cute dinosaur centers and check out the other deals they have going on right now! Want to share the love with fellow teacher friends? Please pin this image to let them know where they can scoop up their own copy!